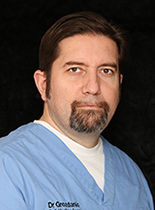 Dr. Grozdanic obtained his veterinary degree from the University of Belgrade, Serbia in 1998. Following his basic veterinary education, he obtained his doctor of science degree (PhD) in the field of neuroscience (2002) and finished his clinical veterinary ophthalmology residency in 2007 at the Iowa State University (ISU). Dr. Grozdanic was an assistant professor and staff ophthalmologist with the Department of Veterinary Clinical Sciences at ISU (2007-2011). Dr. Grozdanic published 27 manuscripts and one book chapter in the field of glaucoma, neuroprotection, autoimmune retinal disease, ocular imaging and stem cell therapy for blinding ocular diseases. He also gave more than 50 national and international presentations on advanced diagnostic and treatment modalities for different eye diseases. Dr. Grozdanic also has the distinguished honor of being the first veterinary ophthalmologist in North America to perform artificial corneal transplants in a veterinary patient and he has developed numerous novel diagnostic and treatment routines for different canine, feline and equine ocular diseases. He is actively consulting for US Department of Defense and Secret Service canine units, and he also provided free consulting to more than 80 veterinary ophthalmologists from 6 different continents on more than 300 complex veterinary ophthalmology clinical cases. Dr. Grozdanic performs all complex extraocular (eyelid and corneal surgeries) and intraocular (cataract, glaucoma and vitreo-retinal surgeries) procedures. His special interests include early diagnostic modalities for glaucoma and retinal diseases, advanced medical and surgical procedures for treatment of glaucoma, endoscopic ocular and orbital surgeries, laser therapy for different ocular diseases, special therapies for autoimmune retinal diseases, and stem cell based therapies for blinding ocular diseases. Dr. Kecova was born in Prague, Czech Republic. She graduated from the University of Veterinary Sciences in Brno, Czech Republic in 2000. After the graduation, she stayed at the University as a post-doctoral student and later as a faculty at the Department of Surgery, where she specialized in Ophthalmology. She has obtained her PhD in Ophthalmology from University of Veterinary Sciences in Brno in 2007. She worked as a research scientist at the College of Veterinary Medicine - Iowa State University as a part of Dr. Grozdanicâ€™s team. Her main areas of interest were glaucoma and immune-mediated retinal diseases. In May 2011, she relocated to Iowa City, where she worked until July 2013 at the VA Center of Excellence for the Prevention and Treatment of Vision Loss. In August 2013, she went to Houston for an ophthalmology internship with Eye Care for Animals. After her daughter was born in 2014, she moved back to Iowa and since August 2015 works at Animal Eye Consultants. 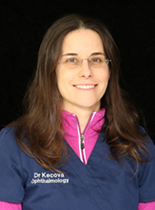 Outside work, Dr. Kecova spends as much time as possible with her family and loves sailing, skiing and hiking. 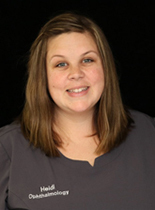 Heidi graduated in 2006 from Iowa State University with a degree in Animal Science/Pre-Vet. She has been working with Dr. Grozdanic as his ophthalmology technician for the past 5 years. She has extensive experience in anesthesia and monitoring critical cases. Heidi worked in the Emergency and Critical Care field as a technician for 10+ years. She has also worked as a practice inventory manager. 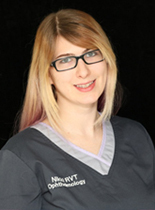 She has worked in a holistic veterinary practice and has experience in a general small & large animal practice. Outside of work she loves to spend time with her husband, Shawn and two beautiful children, Harper and Hayden, as well as their fur kids. Nikki is a registered veterinary technician who graduated from Kirkwood Community College's veterinary technician program in May of 2012. Her interests are in biology and clinical pathology. She worked on the emergency and critical care team at Eastern Iowa Veterinary Specialty Center for three years. Nikki has a strong passion for animals and enjoys her work very much. She has four cats at home named Gigi, Fidget, Bandit, and Smokey. She enjoys spending her time with them as she sews and does other art projects.Nikki has also worked with the Best Buddies organization in the past to help children who are mentally challenged and finds it comforting to help those in need. She is semi-fluent in Japanese.